Fennel salad - who comes up with things like this? One of my danish friends gave me a book on salads by Claus Meyer called Salatværksted (Salad workshop). A great book with salads for every season. One of the first I had to try was this Fennel Salad. It's light, crispy and phenomenal with Salmon. What it lacks in color, it has tenfolds in taste. Wash the fennels, cut it very thin on a mandolin. Put the fennel slices in ice cold water. 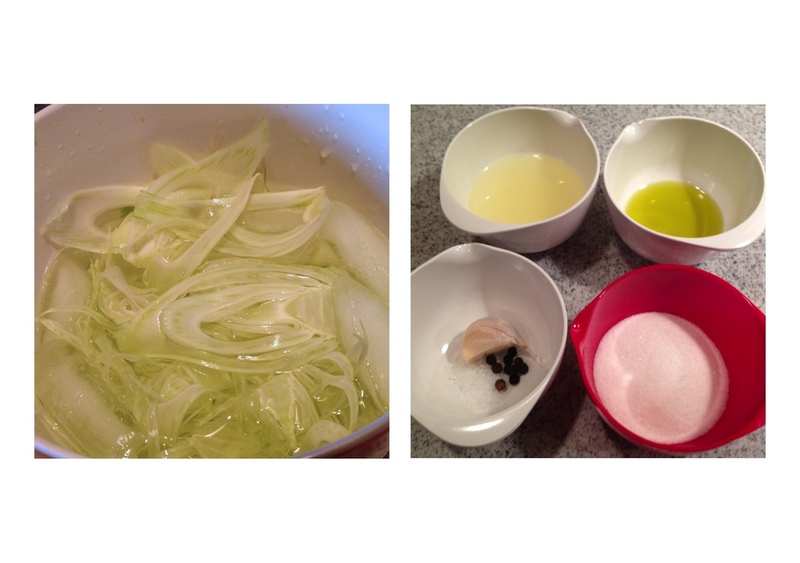 Thinly sliced fennel and the dressing. Mix the ingredients for the dressing, season with salt and pepper. Drain and wipe the fennels dry with kitchen towel. Mix the fennel with the dressing and season with salt and pepper.